Continuing the legacy by meeting today's needs. Through the replacement of all building systems, structural and seismic upgrades, enhanced access, reconfiguration of interiors and a new beach board walk – The Cabrillo Pavilion renovation will establish a modern recreation facility for year-round activity. Including youth programs and adult fitness, expanded summer camps, competitive events and a casual affordable ocean front restaurant. Free and low-cost programming will serve a broad cross section of the community. With the Pacific Ocean on our doorstep and the Santa Ynez mountains in the backyard, Santa Barbara residents take advantage of nature and the outdoors for recreation, exercise, and enhancing our quality of life. We also take pride in Santa Barbara’s cultural heritage, working to preserve the many historic landmarks that give our city its distinctive character. 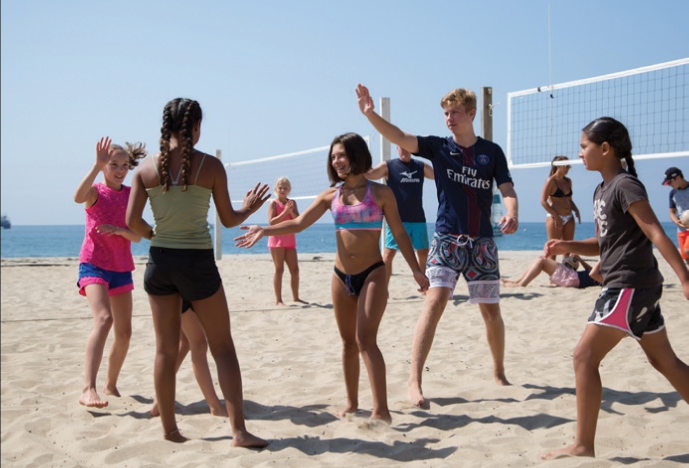 Generations of Santa Barbara’s athletes, from lifeguards to volleyball players and triathlon athletes, have honed their skills on the shores of East Beach. Each summer, thousands of our community’s children learn vital ocean safety skills in the Santa Barbara Junior Lifeguard program and enjoy healthy outdoor activity through beach camps based at the Cabrillo Pavilion. Renovating the Pavilion will provide opportunities to serve youth year-round and enhance the over- all beach experience for all visitors. With your support, the Campaign for the Cabrillo Pavilion will revitalize a beachfront landmark to serve residents and visitors for generations to come.